Today marks the start of the Lunar New Year, which is celebrated in Pennsylvania and around the world by individuals of Chinese, Japanese, Korean, Mongolian, Tibetan, and Vietnamese ancestry. The Lunar New Year is one of the most prominent and celebrated festivals in the world. In China, for example, the sheer number of people working in large urban areas who return to their hometowns to celebrate Lunar New Year festivities accounts for the largest annual mass human migration in the world. Here in Pennsylvania, many Asian American families herald the beginning of the traditional lunisolar calendar by giving their homes a thorough deep cleaning. Families gather for a traditional meal, and exchange beautifully packaged red envelopes containing money to signify good luck and prosperity for the year to come. My mother’s family is originally from Mainland China – my grandmother was born and raised in Beijing, China; my mother was born and raised in Taiwan, and I was born and raised in Pennsylvania. Throughout my family’s journey, we have always cherished celebrating Lunar New Year as generations of our family have before us. These traditions honor our heritage and connect us with new neighbors and friends. If you’d like to learn of a celebration near you, please refer to the Commission’s February newsletter here for a detailed list of events happening across Pennsylvania. 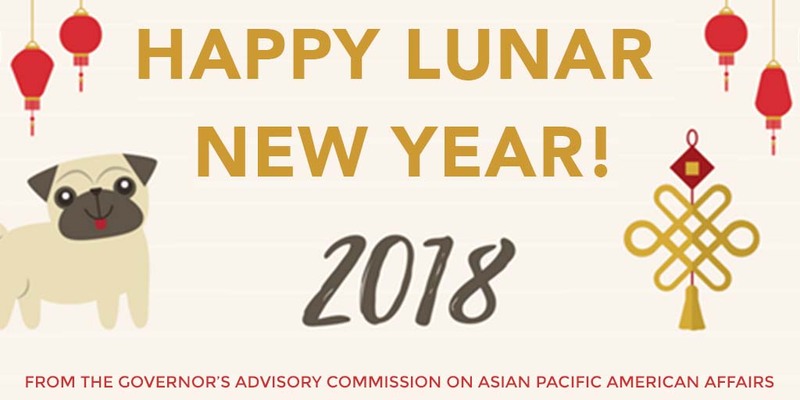 On behalf of Governor Wolf’s Advisory Commission on Asian Pacific American Affairs, we wish you a Year of the Dog filled with peace, prosperity, health, and joy!